Number one by name, number one by nature. Mate1.com is one of the classiest online dating platforms around. It has struck the perfect balance between convenience and innovation, combining a simple to use interface with some cutting edge features. It’s no surprise that Mate1 boasts around 30 million users. Creative members have the option of recording a voice profile, while few dating sites can compare with the entirely free service for women. Read more at the full Mate1.com review below. Experienced online daters will find a number of very familiar and welcome features. For example, you can contact other users by private message, instant chat and the “hi” tool, similar to a “wink” or a “flirt.” However, mate1.com has enhanced these options with something entirely creative, as users are also able to introduce themselves via a voice profile. There are also plenty of innovations which are designed to make your online dating experience as user-friendly as possible. For example, you can create a hotlist in order to manage all your favorite matches, while the news feed enables you to keep tabs on what they are doing. It is also very easy to see who has shown an interest in you, thanks to the “Interested in me” feature, which displays who has flirted with you and who has viewed your profile. You will also be able to see at a glance when a user was last online, which can help you sift the occasional user from the serious dater. The basic process is extremely simple and will have you browsing other profiles in no time. All you need to do is submit a few basic details, such as date of birth, gender, e-mail address, user name and a password. However, you will then be asked to complete a short “mini-profile” which consists of simple to answer drop-down menus in response to questions about your lifestyle and physical attributes. You can then add up to 20 photos and you are ready to browse. You are then able to populate your profile, which is a great opportunity to tell other users a little more about yourself, especially the unique section on your favorite and least favorite things, which really will help you to narrow down the field. 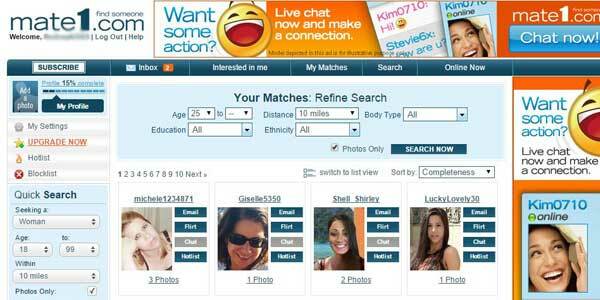 Some people are understandably wary of online dating, as they are concerned that their personal details will be misused. You should have no worries on this score when it comes to Mate1. For a start, the site is encrypted, keeping details away from prying eyes. Most importantly, you only need to hit a button in order to block a problematic member from interacting with you. And if you need any further tips, the site provides a safety advice page for online dating. For a start, women need not pay a cent. That’s right, women have full usability of the site for free. Men can also decide to pay nothing, but their functionality will be seriously restricted as they won’t be allowed to directly contact other users nor see who has viewed their profile. An easy way to get a feel for mate one is to purchase the 3-day trial for just $1.95. 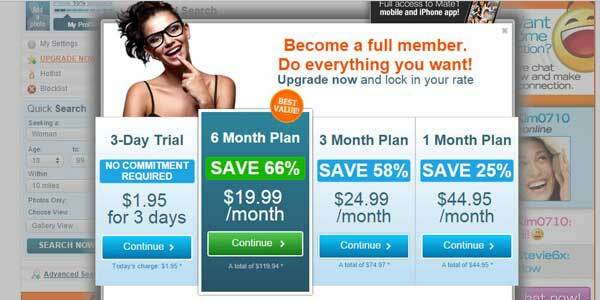 If you opt for a 1-month package, then it will cost you $44.95. However, users receive a discount on multi-month deals and so a 3-month plan costs $24.99 monthly and a 6-month package is only $19.99. As any Mate1.com review will tell you, this is a site which has plenty to offer for all types of users, from those looking for some casual fun to others looking for the love of their life. How does one site accommodate such diversity? By being incredibly intuitive and simple to use. Potential matches are generated automatically and displayed on your dashboard each time you log in, based on the information you have submitted. All you need do is decide whether to click the “interested” button. The dashboard itself is extremely logically laid out and puts you just a click away from pretty much anything you need. The tabs along the top of the page link directly to your inbox, matches and the search function. Meanwhile, your hotlist and personal settings are among the side bar features. A top quality app means that you can follow all the action from your Android or iPhone. There are two possible approaches to the Mate1.com search. You can click “My Matches” in order to view potential matches tailored for your requirements, calculated by the information you have provided. This is quite a hands-off matchmaking tool, although if you really want someone else to do the work read our review on the excellent ProfessionalMatch.com. However, if you wish to make your search even more specific, then you can conduct a manual search. The basic search allows you to find someone based on broad categories such as age, gender and location. The advanced search means that you can narrow down your quest to include any number of factors, from physical features to education, religion, attitudes towards smoking and drinking and more. It is also possible to view search results by the extent to which a profile has been completed, who is online now and keyword. In other words, you are bound to find what you are looking for. If you are looking for an all-round quality dating site, with plenty of users, quality features and a platform which is a pleasure to use, then look no further. Mate1 has it all. So long as you are prepared to invest time in a good profile and interacting with other users, you will have plenty of fun. Most importantly, you have every chance of finding the person for you.